D.J. Agdeppa was born in the Philippines and moved to Maui during the summer of 1998. She graduated from H.P. Baldwin High School in 2006 and later decided to enroll in UH Maui College. D.J. 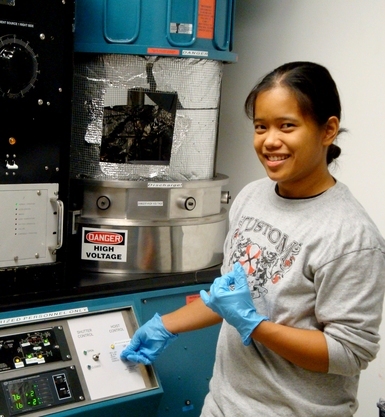 is majoring in Electronics and Computer Engineering Technology and plans to graduate with an associate degree in 2012.
were found to play a part in eliminating defects in the final mirror coating: polishing the substrate, modifying the cleaning method, and implementing a “clean room” near the coating lab. A polished substrate and/or a different method for cleaning provides a smoother initial surface to be coated, while the use of a clean room near the coating lab decreases the chance that the substrate will be contaminated with particles. As long as the pre-coated surface of a substrate remains smooth and free of contaminants, the result should be a decreased number of defects.